Genkan fully manages this most important of processes from allowing Agents and Resellers with their own login and password to check availability and pricing to the mNgement of the booking, communication to the disbursement of funds. Agent has own enquiry email template with own brand. 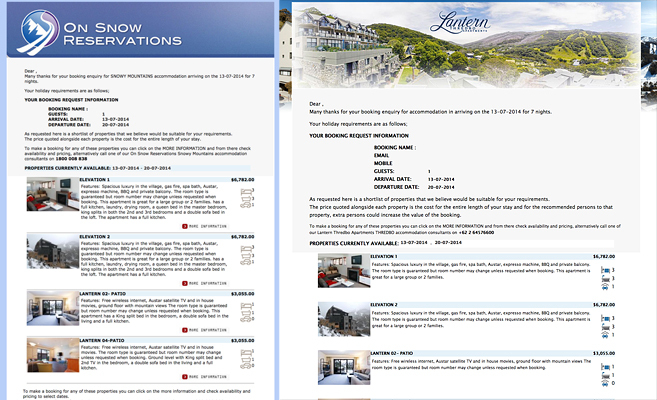 The image to the right demonstrates the same properties from the business on the right compared with the agent on the left using the genkan enquiry email template. Agents have their own login and password. Agents can have their own website and template with genkan content. Agents are automatically sent mails of monies owing and with date. Agents can have their own trust account. To the client the process is completely seamless, the client is totally unaware that there is a reseller.